Childcare is provided for children birth to 4 years old from 8:00 AM until 12:30 PM. Our Worship and Wonder Programs is for children 4 years to 4th Grade and will be offered during both Worship Services. The Rev. Jack M. Caldwell, Senior Minister, will be preaching. 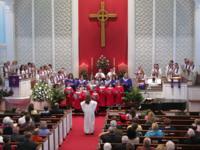 Chancel Choir – An adult choir that sings every Sunday at the 9:30 AM service. Repertoire varies from easy to difficult, old to new. New members are always welcome. Although not required, some musical background does help! Remember, those who sing pray twice! Practice is on Wednesdays from 7:30-9:00 PM. Disciple Bells – An adult bell choir always looks for new regular and substitute members. Some musical background does help, although not necessary. This group performs monthly/seasonally during worship. Practice is Wednesdays from 5:45-6:30 PM. Brass Ensemble – A choir that is for brass players of any age interested in playing in special services. Two-three years background is recommended. This group performs monthly/seasonally during worship. Practice is on Wednesdays from 6:30-7:30 PM. Anniversary Orchestra – An ensemble that meets once a year in the spring for the church’s anniversary which falls on the first Sunday of May. Any instrumentalist of any age is welcome. Rehearsals are typically the two Saturdays before Anniversary Sunday from 10:00 AM – 12:00 noon. Flute Ensemble – An ensemble that meets once a year in the fall for the church’s 11:00 PM Christmas Eve service. Any instrumentalist of any age is welcome, though two-three year background is recommended. Watch the bulletin and newsletter for details about rehearsals. Groups and Soloists – We are always looking for interested musicians and/or vocalists to perform during the second worship service.